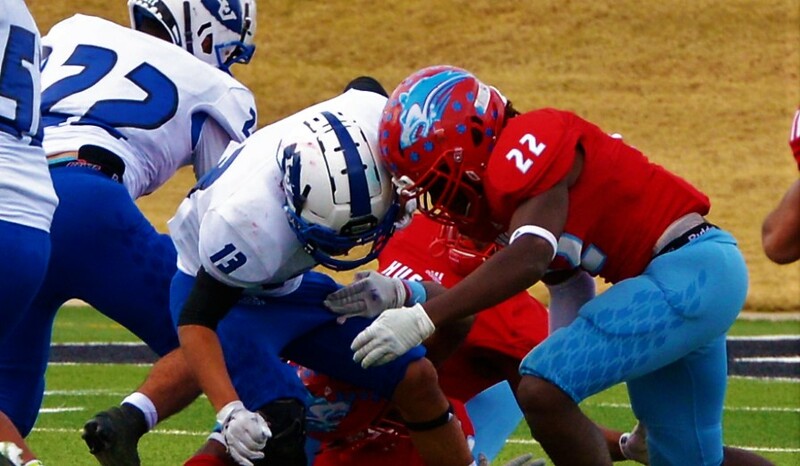 ABILENE, TX — A photo taken microseconds prior to the impact that scared fans, teammates and family of Wichita Falls Hirschi High School varsity defensive end Reggie Jackson, shows helmet-to-helmet contact during a playoff game at Shotwell Stadium in Abilene against San Angelo Lake View. Jackson pursued and was involved in the tackle of a San Angelo Lake View player rushing the ball during Saturday’s 4A Division 1 playoff between Hirschi and San Angelo Lake View. The photo shows Lake View running back, number 13, Rudy Martinez’s helmet making contact. Texas high school football is highly competitive, and in no way are we suggesting this was an intentional hit. After all the players cleared the mound of helmet-clad opponents involved in the tackle, Jackson remained on the ground motionless in the middle of the field, face down. Paramedics rushed to Jackson and fitted him with a neck brace then loaded him on a backboard. Jackson appeared motionless throughout the 10 minutes it took to move him off the field and into an ambulance to be rushed to Hendrick Medical Center in Abilene. According to San Angelo LIVE! Sports Editor Sam Fowler, who took and then reviewed photos taken prior and after the player collision, Jackson’s head was violently pushed left, showing the neck bending leftward as well. The hit happened with less than 50 seconds left in the half. 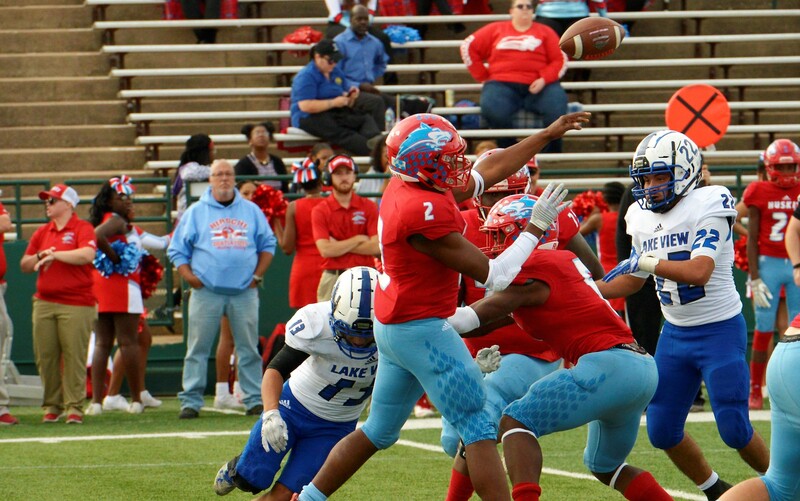 Hirschi led 34-14 at the time and Lake View had the ball, threatening another score. School districts and high school sports organizations take head and back injuries seriously. If there is any doubt, paramedics are instructed to take every precaution, expecting the worst, to include backboard, neck brace, and an ambulance ride to a nearby medical facility for X-rays. The moment of terror, when a KTXS reporter heard paramedics radio that this could be a spinal cord injury, was met with a miracle. KTXS confirmed late last night that Jackson had been released from Hendrick Medical Center in Abilene. Early this morning, a friend and teammate of Jackson’s, Jaron Jordan, provided an update of Jackson’s status. Jordan, number 8, is a corner back and running back for Hirschi. “Reggie Jackson (carried off the field) is ok. Just had a lil numbness and tingling in his left arm. He’s on his way home,” Jordan stated. Jordan elaborated with us in an interview. “Just a little stinger causing a little numbness and tingling in his left arm,” Jordan said. Jackson has a follow-on appointment for an additional X-ray to make sure his recovery is going well, Jordan said. Jackson, number 22 on the Hirschi High School Huskies football team, is a junior defensive end. His team defeated Lake View yesterday afternoon 55-23 in the 4A Division 1 Area Round of the UIL Texas High School Playoffs. The Huskies advance to the Regional Round against Decatur on Friday in Graham at 7 p.m.